Diamond Plate Plastic Floor Tile is an easy do-it-yourself flooring system that takes only minutes to put together. Lays on just about any surface with it's own weight. Use as an area floor with our border tiles or go wall-to-wall by cutting tiles to size and shape. Perfect for shop, trailer, garage, store, tradeshow, fitness rooms, outdoor deck and more. Border and Corner Tiles provide a finishing touch. Recommended to not necessarily to go wall-to-wall but rather be used as an area rug with our border tiles leaving a few inches of uncovered sub-floor around the periphery. It is moisture and mildew resistant, and creates a moisture barrier from the concrete so everything in your basement is safe and protected. No glues, no toxic fumes, and no mess to worry about. Need more inspiration? 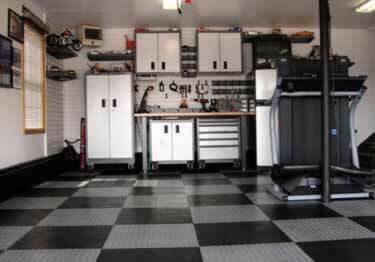 Check out how easy it is to arrange Diamond Plate Plastic flooring for a garage floor to be proud of! For Commercial and Residential use. Perfect for shop, trailer, garage, store, tradeshow, fitness rooms, outdoor deck and more. Chemical Resistant - resistant to oil, grease, petroleum products, antifreeze and most household chemicals, UV stable and stain resistant. How can I tell if this product is the same as I have already? I do not see a product name of any kind stamped on my tiles I have. Diamond Plate Plastic Floor Tile is an easy do-it-yourself flooring system that takes only minutes to put together. InvisaTread Anti Slip Solution will make most surfaces slip resistant when wet without changing their color or texture. Combines the toughness & durability of a real aluminum tread surface with the versatility of an interlocking tile.